Students at Brockenhurst College are to perform their take on Bob Carlton’s award-winning Jukebox Musical ‘Return to the Forbidden Planet’. Tickets are still available for the production which will be performed at 7pm each evening from 11th to 14th December in the College’s Kemball Theatre. 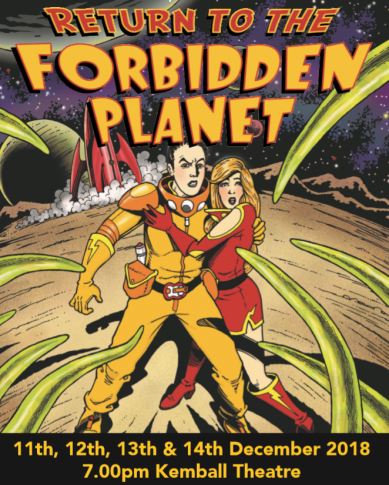 ‘Return to the Forbidden Planet’ tells the story of a hyperspace adventure in which a spaceship makes an emergency landing on the uncharted planet D’Illyria. The planet’s only residents are a mad scientist and his daughter who were unwillingly sent into hyper-space some fifteen years earlier. The original musical won the Laurence Olivier Award for Best New Musical in 1989 and 1990 and has been reproduced in many countries around the world. Students are drawn from a range of different courses including Dance, Drama, Music, Performing Arts and Production Arts and were selected following two rounds of auditions. Many are auditioning for prestigious institutions including second year Performing Arts student Will Laing from Salisbury who has accepted a place at Emil Dale Academy where he will specialise in Musical Theatre. Freya Spearing, also a second year Performing Arts student from Salisbury said: “I’m really excited about performing. “Rehearsals have been a bit manic but everyone’s having such a great time and being so supportive of each other and I can’t wait to see it all come together” she added. Musical Director Tara Gadd said: “It’s going to be a fantastic show involving fifty students as actors, dancers, musicians and technical crew. “The whole project has been a collaborative one and the first for our new Performing Arts Academy” she added. Tickets cost £8 (concessions £6) and can be purchased by through the College on 01590625555 or reception@brock.ac.uk.